I like finding children’s books that are part of a larger series since if Arya likes the first book than she usually likes all the books in the series. Good Night Vermont by Michael Tougias and Cooper Kelly is one of 33 (and counting) books of the “Good Night Our World” series by publisher Our World of Books. Although I thought the book was amateurish, my baby liked the pictures enough for me to consider buying it given that it costs under $4. The Good Night Our World series of books focuses on a specific location with illustrations and text supposedly unique to that location. In the case of Good Night Vermont, the book is supposedly focused on the unique attributes of the state of Vermont. The problems with the text begin with the front cover. The font of “Good Night” is different than the font of “Vermont”. While “Good Night” has a drop shadow and rounded type, “Vermont” appears as a straight, bold font. Children may not necessarily care about discrepancies with the cover font, but it is just one of many issues adult reader will have with the book. The plot supposedly takes readers through a day in Vermont starting with tapping a maple tree in the morning with snow on the ground. Oddly, the text then skips quickly through the seasons showing a few aspects of the state in each season. Adult readers will quickly deduce that the “Good Morning”, “Good Afternoon”, “Good Night” theme was simply an attempt by the publisher to piggyback on the success of “Good Night Moon“. Rather than taking the opportunity to teach children about the seasons, the book confuses the passing of a day with the passage of a year. If there was a plot or at least a general theme, Good Night Vermont would come across as a cheeky book targeted at tourists. Rather, the entire text reads like a random assortment of ideas the author read about in a travel guide to the state. While I thought the text was pointless, both Arya and I liked the illustrations. With a cute, almost anime-feel to the drawings, illustrator Cooper Kelly shows different aspects of Vermont mentioned in the book. Arya liked the bright orange on the pages with fishermen and friends. I thought the picture of the country store was particularly well done as it resembled the real life country stores we visited when we took baby to Vermont. 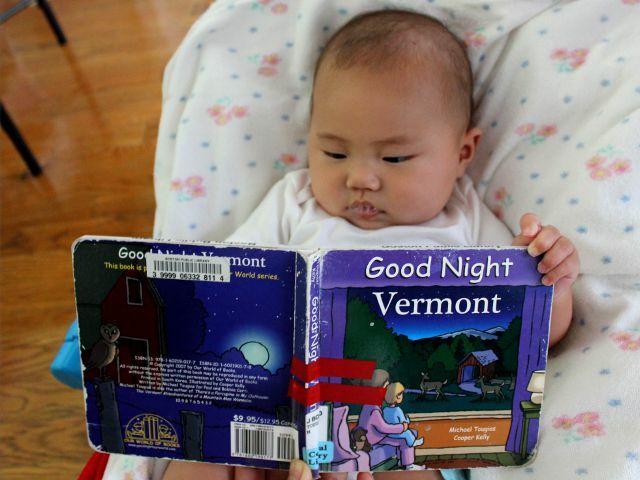 Ironically, the problems with Good Night Vermont are only applicable for children old enough to read the book on their own. Babies and young toddlers will likely enjoy the book because of the colorful pictures and novel topic. Children who are from New England or soon to visit the area will especially enjoy seeing the pictures of the country store or skiers before seeing similar sights in real life. Good Night Vermont costs (including shipping) under $4 new and, strangely, more than $8 used from Amazon.